Successfully Added Widescreen MP4 Player Watch - 1.8 Inch Display - 1GB to your Shopping Cart. Looking for a top quality MP4 Wrist Watch Player? 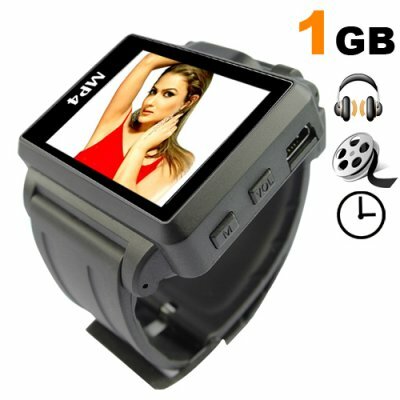 Then this is the product you have been waiting for; the 1GB version of our famous CVESG-S818 Widescreen MP4 Player Watch! This multimedia watch features a crisp 1.8 inch TFT screen, digital video player, digital music player, FM radio, built-in speaker, and many other added media features that make this wholesale MP4 watch truly stand out from all rest. With such a low wholesale price, why not buy one for yourself and one to give to a friend or resell on your own internet storefront? It is in stock in our warehouse right now and will be sent out immediately after you place your order. Why wait any longer? Click "add to cart" to order yours now! An exclusive product from your home of unique electronics, Chinavasion!